As a kid I used to love listening to The Beatles and spent many hours just listening to the records and admiring the jackets' artwork. I remember one summer when a friend of mine returned from Italy bringing with him some records for us to listen to. He introduced me to the music of Genesis through the albums Foxtrot and Nursery Cryme, which I loved from the first time I heard them. It made such a big impression that, in a way, it opened the doors to the pursuit of my musical aspirations. My most coveted bands at the time were British progressive rock bands like Genesis, Yes, Pink Floyd, Camel, Gentle Giant, Jethro Tull, etcetera. Those bands had something special and unique in their approach to music that really caught my attention. I started toying with the idea of recording music in a similar genre but in those days, to produce a quality recording meant spending lots of money. When the digital era came upon the music scene, it made things easier to achieve and brought the overall production prices down to a manageable level. Once I learned how to work in the digital environment I went ahead and upped my game to fulfill some of my musical ideas. MSJ: If you weren’t involved in music what do you think you'd be doing? My mother was an artist and my father was a civil engineer. They had five children, and we all pretty much inherited my mother’s artistic side. I consider myself an artist, and as such I create things out of my imagination. I have a degree in advertising design and do a great deal of commercial artwork. One thing I love about making my albums is that I get to do my own artwork. I love creating images and visual ideas so I take a lot of joy in the imagery. To me, the album art is an integral part of the whole experience and as important as the music that’s inside of it. I put as much work into the artwork as I do into the music and my only hope is that when someone buys the record they appreciate all the pieces that went into it. My first recorded music project came out in 2008, but I have been doing artwork for a living for over 30 years. MSJ: You’ve got a new album coming out. How does it differ from your last release? I see my albums as projects that encompass several pieces. 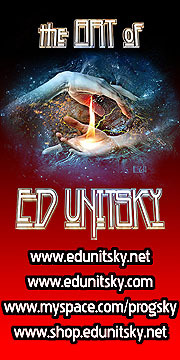 My last album was titled “2014 Music From An Expanded Universe.” It featured ex-King Crimson guitar virtuoso Trey Gunn and Peter Gabriel’s former drummer Jerry Marotta. The sound of that album is in a way reminiscent of the King Crimson records from the 80s line up. At least that’s how I see it. When I finished the album, I went back to work on its companion piece. I made a short film titled “PERSISTENCE” and released a CD with the soundtrack for it. Like the album before, it featured Trey in it and had a similar sound to the music from 2014. Those two CDs were very different from any of my previous releases and the new album is very different from them also. My first CD was a tribute of sorts to Genesis and included some of their songs as well as some original songs made in the same style as Genesis, (more or less). The second CD was pretty much a continuation of the first one basically composed of pieces that were unfinished before the first CD came out or alternate versions of songs that I had done before. The third and fourth had that King Crimson vibe to them but the new one is a whole new thing for me. The album is a true concept album and tells a story. There is a narrator pacing the storyline before the musical pieces, and the CD booklet tells the story from a different point of view. I hope that listeners grasp the full intent of the project. My idea is to use the narration and the written story as a setup and let the music and the listener’s imagination fill the gaps. This allows for some personal interpretation, which is something I like. With every album I try to broaden my musical horizons so I consciously try to avoid repeating my approach. Having said that, I think there is a certain DNA to all of my pieces that define them as mine. MSJ: How is it similar? The album consists of instrumental pieces set up by narration. Most of my music is instrumental pieces which is something that’s also prevalent on this album. My first album back in 2008 was “Leon Alvarado Plays Genesis”. I have had musicians like Bill Bruford, John Goodsall (from Brand X), Trey Gunn, Jerry Marotta, Billy Sherwood and Rick Wakeman on my records. I think it’s pretty safe to say that my influences are Genesis, King Crimson and Yes. Of course, there also are other influences like Pink Floyd, Vangelis and other lesser known musicians and bands that may not be as recognizable as catalysts in my music. I also enjoy movie soundtracks and composers like Jerry Goldsmith and John Williams. I always have ideas circulating in my head. I have another project all lined up that is quite different from this one but requires some thought as to how I would want to release it, mainly because it diverges somewhat from the rock genre. I would like to do more video, which really stirs my interest, but I am still working on how to produce it at a reasonable cost. I’m sure there is a learning curve to that but I’m advancing with each bit of video I work on. To be honest, I don’t even know how to label my music as it is. Neither do many people. A lot of my music goes through stages and moods and textures in parts and in other parts it flat out rocks. Because of that I have been labeled as an “ambient” musician by some and a “progressive rock” musician by others, but in reality it is hard to attach a genre to my music. I make what I call “headphone music” which is best appreciated by sitting down and listening to the records from beginning to end without distractions. Many people toss a CD into the stereo and go about their business while the music plays in the background. When I buy an album, I give it all my attention and that’s the way I would like for my music to be played. I am basically making music for the way I would want to enjoy it. Of course, I am speaking from the point of view of a music fan. Of course! I have been fortunate enough to have some of my musical heroes playing on my albums, and that’s like a dream come true. Unfortunately, there are a few musicians that I would have loved to play with on my records that aren’t with us any more. I had always dreamed of having Chris Squire on one of my records, and that’s no longer a possibility. But there are so many outstanding musicians out there that I wouldn’t know who to begin with. I would like to do some music with vocals on it but I am not much of a singer myself so I would love to have someone like Jon Anderson do a piece with me. I also love Pat Mastelotto’s drumming and would like someday to create a piece that would suit his style. The thing for me is more about coming out with the appropriate pieces that would suit a particular musician’s style than anything else. I feel that if I can write a piece of music with a particular musician in mind and pull it off, this gives me the confidence to approach that musician to begin with. I have spoken before to Steve Hackett about working on a piece of music and he seemed very open to it, but I’m sure in the end it has to be about the right piece of music for him. From a financial standpoint I don’t see how it could ever be of any help unless you are willing to give it away. Also, streaming tends to break albums up into pieces. By that I mean that people stream music randomly and rarely get to listen to a full album the way and in the order it was intended. The streaming services' argument is that they will give the artist exposure that they didn’t have before. That may be true but I haven’t seen any of that exposure turn into actual income. Producing and releasing an album may be cheaper than it was even twenty years ago but it’s not cheap. Why would a musician put thousands of dollars and countless hours into an album to not even recoup his cost? As an independent musician I can see some positives behind the exposure. After all, without a big budget for advertising, we only have certain tools available to us. However, it comes at a price. The price being that many people will only stream your music without ever paying for it. So, in the end the negatives may offset the positives but since everyone, (with the exception of a few mega-popular stars), is available on those services, it has become more or less a necessary evil. If you aren’t on at least one of the streaming services you just don’t exist for many people. I think that so as long as the recording doesn’t sound like a professional product, it is sort of like free advertising. For example, the other day I was watching YouTube and saw a bit of a Yes show from their current tour. What it did for me was cause me to wish they would release a professionally recorded live version of the tour. So in my mind it worked as an advertisement benefiting the band. After all, they are bootlegs and bootlegs have been going on for quite some time. The thing with bootlegs is that in the end, they make fans yearn for more, and more with a better sound quality. Now, if they are selling the recordings and making a profit, I think that’s another story because they are now directly screwing with the artist’s income plus plainly making money off of someone else’s labor. I have to say that I have never in my life given any thought to that. But, I guess my arch nemesis would have to be someone who has made millions through some sort of music that I greatly dislike - maybe Kanye West? I don’t know. I really don’t think about these things. Rick Wakeman on keyboards, Steve Hackett on guitars, Tony Levin on bass, Steve Smith on drums. Rick is just one of my all-time favorite keyboard players, Steve Hackett is the one man from the original prog scene that has kept the flame true and through, Tony Levin is just an amazingly creative bass player. I had the chance to spend some time with him up in New York and he is just a brilliant musician, and Steve Smith is one of those incredibly talented drummers. He was the drummer for Jean Luc Ponty’s Enigmatic Ocean album which is a brilliant record with amazing drumming throughout. I met Steve a couple of years ago at NAMM where he played with his band in one of the booths. Not a fair question because my favorite music is not necessarily what makes the most money, and if I were putting a music festival it would be for the money. However, let’s say that money wasn’t the issue, it would then be more or less a prog affair. Yes, Marillion, Steve Hackett, Roger Hodgson, Camel; that sort of line up. If we were back in the late 70s I would have said Genesis, Yes, Pink Floyd, Led Zeppelin and Bob Marley for starters. Last CD I bought was Dave Gilmour Rattle That Loc, but that was a little while ago. I have been concentrating on finishing my album and working on the promotional materials and that sort of thing. I played Yes’ Drama yesterday and again, because I saw something about it in YouTube so I got my CD and played it through. Not lately, but when I get to read I like books with intriguing story lines. I like to read John Grisham’s books because for some reason I seem to be attracted to books with lawyers trying to get out of the seemingly impossible. I keep it light these days; when a bit younger I used to read books like Gabriel Garcia Marquez’ The General in His Labyrinth but to be honest, I hardly have any time to read these days. I saw a band called “Brit Floyd.” They are a tribute to Pink Floyd, and they do an excellent job at it. The original band is one of my favorites and I have seen them four times, but today there’s no more Floyd so if you want to listen to their music played live and with great quality, these guys fit the bill perfectly. I like sometimes to listen to salsa music. People like Ruben Blades have some really amazing albums in the genre. Every Wednesday night I jam with my friends. Every Wednesday night there are several Spinal Tap moments. Many years ago I got to meet John Entwistle backstage after one of his shows. I had worked on the tour poster and wanted to know what his opinion of it was. In the design we had incorporated a big spider crawling above the Union Jack and we knew how much he liked spiders. He had next to him what I assume was his wife and she served sort of like a translator. I couldn’t understand anything he was saying because he slurred and mumbled his speech. On the other hand, I think he was also hard of hearing because everything I would say to him she would repeat exactly but louder. So there we were, standing inches from each other but having this lady repeating everything we said to each other. I would ask: “Did you like the poster?” and then his wife would repeat very loudly: “DID YOU LIKE THE POSTER?” He would then mumble something that sounded completely random and his wife would yell: “YES, HE LIKED IT A LOT.” After a few minutes it got to the point where whenever I wanted to say something, I would look at her first to make sure she heard me. The whole thing was strange but in a way it was also very funny. Two men standing close to each other seemingly speaking the same language but having to use this lady to translate everything without translating. Neil Armstrong. In my head, he was the Columbus of my generation. The first man to go where no man has gone… well, you know the rest. Walt Disney. He was a major inspiration throughout my life and the creator of the happiest place on Earth. Steve Jobs, because I think he was another great visionary who had the ability to see things differently. Sorry to my vegetarian friends but the menu would have steak on it. If you are a fan of progressive rock, if you like soundtracks, if you like science-fiction, if you like cool visuals and the idea of an album that tells a story. If you want to hear Billy Sherwood and Rick Wakeman play in something new and original, then you should check out my new album because it’s a perfect fit for you. MSJ: This interview is available in book format (hardcover and paperback) in Music Street Journal: 2016 Volume 4 at lulu.com/strangesound.